Mothers are wonderful so many reasons, not least because they pick us up when we fall, they listen and offer advice and greet us with open arms after long absences from home. 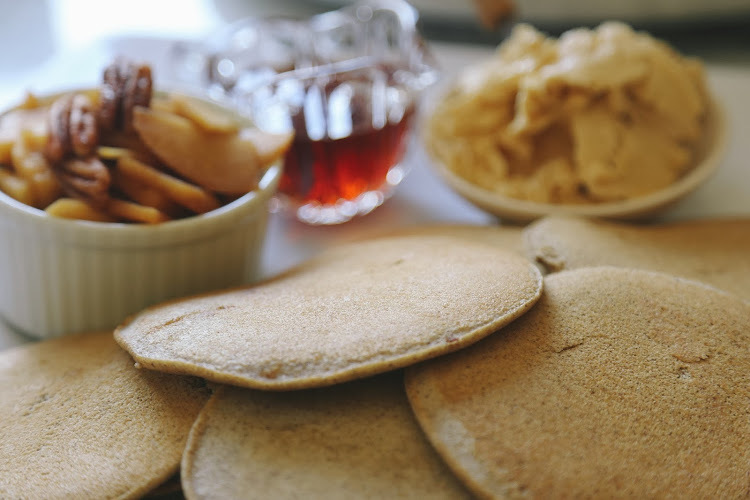 Mothers are also wonderful because they adapt their cooking styles to food allergies and breathe new life into old favourites, such as flapjacks with maple syrup. This is my mother's adaptation of soft flapjacks, made with buckwheat flour. 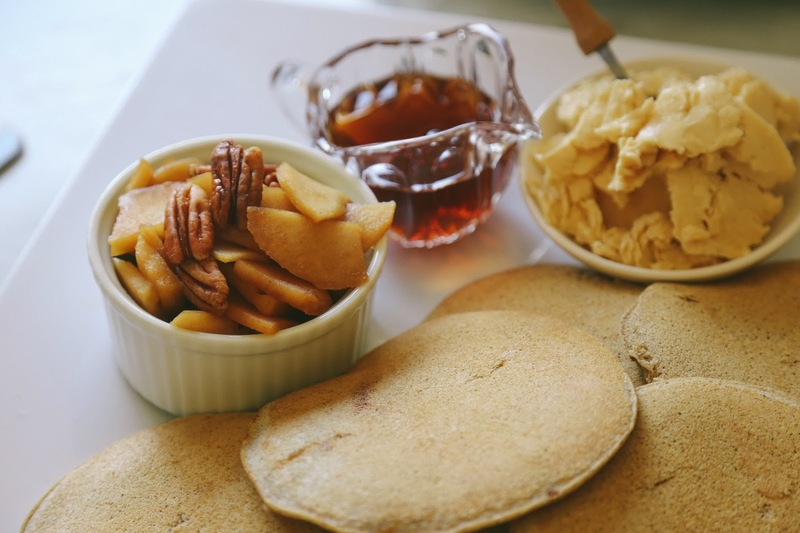 Gluten free, delicious and served steaming hot with softly whipped maple butter, stewed apples and pecans and traditional Canadian maple syrup. They're dairy free too, but do contain eggs. In a small mixing bowl, place butter and begin to gently whip. Add a thin stream of maple syrup until the creamy mixture is pale and fluffy and all of the maple syrup is incorporated. Scrape the maple butter into a small serving dish and refrigerate until ready to use. Can be made in advance. Peel and core apples, chop roughly into approximately one inch slices. Heat a small pan, add apple pieces, pecans and finely grate about 1/4 teaspoon of cinnamon (or use 1/4 tsp ground cinnamon if you don't have a cinnamon grater). Stir to coat evenly. Add the maple syrup or orange juice (the preference is up to you) and cook, stirring until the apple softens. Serve steaming hot with flapjacks. De-lish! *400mL full cream dairy milk may be substituted. Sift dry ingredients into a large bowl, make a well in the centre and pour in the rice milk. Add the eggs and whisk to incorporate. Heat a large frypan over medium heat, add a tablespoon of olive oil and once hot gently pour in the batter in batches. You do not need to turn the frypan to spread the batter, just pour the desired volume, without overcrowding. 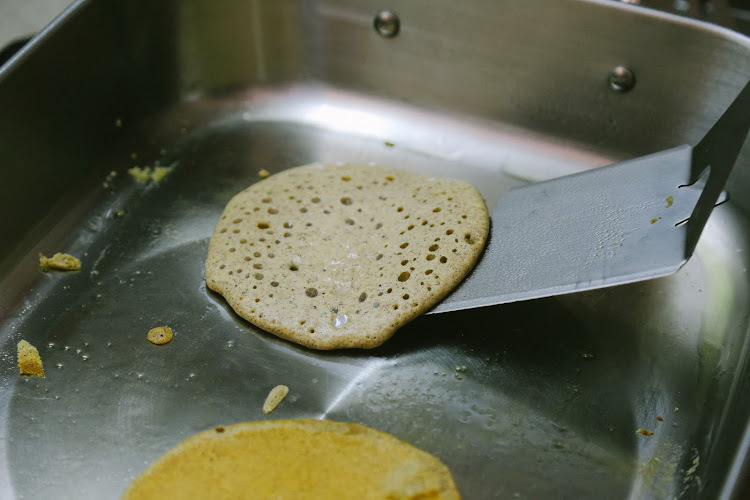 Tiny bubbles will appear in the cooking flapjacks. Flip them once the bubbles begin to burst. They should have an even, slightly golden colour. Cook for a further 20-30 seconds or until both sides are evenly golden. Serve immediately with whipped maple butter and stewed apples with pecans. This is an indulgent brekky that won't top the world's healthiest breakfast list but when it's a rainy day and you're indoors with your family, it's a treat everyone can enjoy. Lazy weekends with family, flapjacks and a game of Scrabble to follow. The kids can make quilt fortresses in the lounge room whilst the rain continues to pour outside. They'll be laughter, cuddles and soft music. Oh the fun to be had on rainy days! They have to be delicious! You're not joining the 52 project this year, right? I'll miss your pictures! I have a new blog and I want to focus more on pictures! Any tips?